This article is about a place mentioned in the New Testament. For other uses, see Cana (disambiguation). The Gospel of John refers a number of times to a town called Cana of Galilee (Ancient Greek: Κανὰ τῆς Γαλιλαίας). The name possibly derives from the Hebrew or Aramaic word for reeds. Cana is very positively located in Shepherd's Historical Atlas, 1923: modern scholars are less sure. Among Christians and other students of the New Testament, Cana is best known as the place where, according to the Fourth Gospel, Jesus performed "the first of his signs", his first public miracle, the turning of a large quantity of water into wine at a wedding feast (John 2:1–11) when the wine provided by the bridegroom had run out. Although none of the synoptic gospels record the event, mainstream Christian tradition holds that this is the first public miracle of Jesus. The other biblical references to Cana are also in John: John 4:46, which mentions that Jesus is visiting Cana when he is asked to heal the son of a royal official at Capernaum; and John 21:2, where it is mentioned that Nathanael (sometimes identified with the Bartholomew included in the synoptic gospels' lists of apostles) comes from Cana. 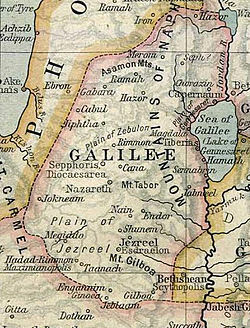 The Book of Joshua mentions one city (19:28) and one brook (16:8; 17:9) named Cana – neither is likely to be the Cana of Galilee. In secular history, the annals of Assyrian king Tiglath-Pileser III, who conquered the Galilee in a 733 BC campaign, contain a badly preserved list of cities  which had been thought to mention a certain Kana. It relates 650 captives were taken there. However, a revised transliteration revealed the one well-preserved syllable to be Ku, not Ka. Flavius Josephus mentions more than one place named Cana; in the context of the Galilee there are two mentions in his Life: one is a place on the road from Iulias, and the other is a place where he resided, about a day's walk from Tiberias. Kafr Kanna, blue; Khirbet Qana, red. There has been much speculation about where Cana might have been. In his Gospel, the author makes no claim to have been at the wedding. Many would regard the story of the wedding at Cana as of theological rather than historical or topographical significance; it is the first of the seven miraculous "signs" by which Jesus's divine status is attested, and around which the gospel is structured. The consensus of modern scholarship is that the Fourth Gospel was addressed to a group of Jewish Christians, and very possibly a group living in Judea province; so it is unlikely that the evangelist would have mentioned a place that did not exist. There is a minority view that the gospel was written for a gentile audience, and those who take this view assert that the description in the passage about the marriage at Cana of "six stone water jars there for the Jewish rites of purification" is specifically for a gentile audience, who would not know the topography of the Holy Land. On this hypothesis the name "Cana" might have some purely symbolic significance. The village of Qana, about 18 miles (29 km) from Tyre, Lebanon, is traditionally held to be the correct site by many Lebanese Christians, and is Eusebius's pick in his 4th century Onomasticon. In times of peace, it is a popular tourist site commemorating the miracle. The first time this site is associated with New Testament Cana is in a mid-17th century report to the Pope by Francesco Quaresimo, the papal emissary to Palestine, where he noted there were two possible candidates: Khirbet Qana and Kafr Kanna. According to the Catholic Encyclopedia, a tradition dating back to the 8th century identifies Cana with the modern Arab town of Kafr Kanna, on the feet of Nazareth range, about 7 kilometres (4.3 mi) northeast of Nazareth. Some scholars believe, according to archaeological evidence, that the identification of Kafr Kanna was the result of the decline of Khirbet Qana beginning in the Mamluk period. They note that it was a common practice for new and more affluent and easily accessible sites to be established in place of old ones to accommodate increases in pilgrim traffic, particularly in the late Medieval and Ottoman periods. The ruined village of Khirbet Qana, meaning "the ruins of Cana", is also a possible candidate. It overlooks the Beit Netofa Valley from the north, and is about 9 kilometres (5.6 mi) north of Kafr Kanna, and has also been noticed by pilgrims since the 12th century or earlier. Its Arabic name is Kana-el-Jalil. Although it parallels the gospel of John, it could either be an ancient retention, as Edward Robinson maintained, or it was attached to the place in conversation with querying pilgrims. This site is located on a limestone outcropping that rises 330 feet (100 m) above the floor of the Bet Netofa Valley, 8 miles (13 km) from Nazareth and 5 miles (8.0 km) northeast of Sepphoris in lower Galilee. It also has long been identified as the true location of New Testament Cana. Recent excavations by the late archaeologist Douglas Edwards (of the University of Puget Sound) and archaeologist Tom McCollough reveal architectural and numismatic remains that demonstrate that the site contained a modest-sized village from the Hellenistic period onward (c. 200 BCE – 650 CE), including a structure which bears similarities to Roman-period synagogues, and several Mikveh pools for Jewish ceremonial bathing. Most importantly, they also uncovered a cave complex on the south slope of the site which showed indications that it had been used as a center for worship, including a sarcophagus lid/altar and a shelf which held two stone vessels in situ, and space for another four vessels, suggesting that Khirbet Kana was regarded as New Testament Cana from a very early time. Remains of an Arab village and a church or monastery were also uncovered immediately south of the cave complex. Other historical evidence from the Byzantine and Medieval periods also show that Khirbet Kana was regarded as the true site of New Testament Cana from a very early period. A guidebook written by a certain Theodosius between 517-527 CE titled The Layout of the Holy Land identifies Khirbet Kana, and indicates that two of the vessels were still at the location. A pilgrim account written by Saewulf in 1101–1103 CE also identifies the site, as do Belard of Ascoli (c. 1155 CE) and Dominican friar Burchard of Mount Sion (1283 CE), and a map by noted cartographer Petrus Vesconte in 1321 CE. Burchard of Mount Sion also describes a cave complex located there which was used as a veneration site where "the place is shown at this day where the six water pots stood, and the dining-room where the tables were placed." Located just north of Kfar Kanna, this site was recently excavated by Israeli archaeologist Yardenna Alexandre. She is convinced that this site is the true location of New Testament Cana. The excavation revealed evidence of a substantial Roman village with a Jewish population which declined considerably in the Late Roman period, and which was finally abandoned in the Byzantine Period, explaining why the pilgrim route was shifted to Kfar Kanna. She also believes the site is precisely identified by Josephus, but other scholars disagree. This site, whose name means "the spring of Cana" is located about a mile north of Nazareth. Some early Christian pilgrim reports mention a spring in association with the Cana of Galilee, but no excavations have been conducted there yet." Ain Qana is considered by some to be a better candidate based on etymological grounds. ^ a b c d e Ewing, W (1915). "Cana". In Orr, James (ed.). International Standard Bible Encyclopedia. Retrieved 2014-04-28. ^ Ewing, W (1915). "Kanah". In Orr, James (ed.). International Standard Bible Encyclopedia. Retrieved 2014-05-28. ^ Tadmor, Hayim; Yamada, Shigeo (eds.). "Tiglath-pileser III 22". RINAP: Royal Inscriptions of the Neo-Assyrian Period. ORACC. Retrieved 13 May 2014. [permanent dead link], also in ISBN 978-1-57506-220-4, p. 61ff. ^ Benjamin Mazar identifies it with Cana "without doubt": Maisler, B (April 1933). מסע תגלת פלאסר השלישי לא"י בשנת 732 [The expedition of Tiglath Pileser III to Palestine in 732 B.C.]. Yediʻot ha-Ḥevrah ha-ʻIvrit la-ḥaḳirat Erets-Yiśraʼel ṿe-ʻatiḳoteha [Bulletin of the Jewish Palestine Exploration Society / Bulletin of the Israel Exploration Society] (in Hebrew). 1 (1). OCLC 7858680. Retrieved 2014-05-15. In Digital Library for International Research Archive, Item #1599. ^ The translations of the inscription by Smith, Rost and Oppenheim all sport the same name. Smith, George (1875). Assyrian Discoveries: An Account of Explorations and Discoveries on the site of Nineveh, during 1873 and 1874. New York: Scribner, Armstrong & Co. p. 283. OCLC 182847392. Retrieved 2014-05-17. Rost, Paul, chapter translator (orig. 1893). Luckenbill, Daniel David, ed. (November 1926). "§779". Historical Records of Assyria: From the Earliest Times to Sargon. Ancient records of Assyria and Babylonia. 1. Chicago: University of Chicago Press. p. 280. Retrieved 2014-05-18. A. Leo Oppenheim, chapter translator. Pritchard, James B, ed. (1969). Ancient Near Eastern Texts: Relating to the Old Testament (Third edition with supplement ed.). Princeton, N.J.: Princeton University Press. p. 283. ISBN 9780691035031. ^ Tadmor, Hayim (1967). "כיבוש הגליל בידי תגלת פלאסר הג'" [The conquest of Galilee by Tiglath-Pileser III]. In Hirschberg, Haïm Zeev; Aviram, Yosef (eds.). כל ארץ נפתלי / Kol erets Naftali [All the land of Naphtali : the twenty-fourth Archaeological Convention, October 1966] (in Hebrew). Yerushalayim: ha-Ḥevrah la-ḥaḳirat Erets-Yiśraʼel ṿe-ʻatiḳoteha. pp. 63–64. OCLC 19147471. ^ Williams, George (1854). "Cana". In Smith, William (ed.). Dictionary of Greek and Roman Geography – via Perseus Project. ^ Mason, Steve (ed.). "The Life of Flavius Josephus, Niese sec. 395". Brill/PACE. ^ Mason, Steve (ed.). "The Life of Flavius Josephus, Niese sec. 84-87". Brill/PACE. ^ Tom McCollough, "Searching For Cana Where Jesus Turned Water into Wine", Biblical Archaeology Review, Nov./Dec. 2015, Vol. 41, No. 6, p. 32. ^ Eusebius, of Caesarea (2006) [manuscript, 1971]. "Kappa, in Joshua". In Wolf, Carl Umhau (ed.). The Onomasticon of Eusebius Pamphili, Compared with the Version of Jerome and Annotated. tertullian.org. Retrieved 7 May 2014. ^ Eusebius, of Caesarea (1904). Klostermann, Erich (ed.). Das Onomastikon der Biblischen Ortsnamen. Die griechischen christlichen Schriftsteller der ersten drei Jahrhunderte (in Greek and Latin). Leipzig: J. C. Hinrichs. pp. 116–117. OCLC 490976390. Retrieved 2014-05-06. ^ Ward, B (1908). "Cana". Catholic Encyclopedia. 3. New York: Robert Appleton Company. ^ a b Robinson, Edward; Eli Smith (1841). Biblical researches in Palestine (1st ed.). Boston: Crocker & Brewster. OCLC 586068890. Retrieved 2014-06-21. pp. 204-208. Wikisource has the text of the 1879 American Cyclopædia article Cana. "Khirbet Qana, a Galilean Village in Regional Perspective: Survey and Excavation, 1997–2004". University of Puget Sound. 2011. Retrieved 2014-05-02.